So what should you do when the air looks bad? Risk it and roll or stay home and feel guilty about your sedentary lifestyle? Before we answer that question our first step is to understand the Air Quality Index (AQI). The AQI was developed by the Environmental Protection Agency (EPA) to better define how clean or polluted our air is . 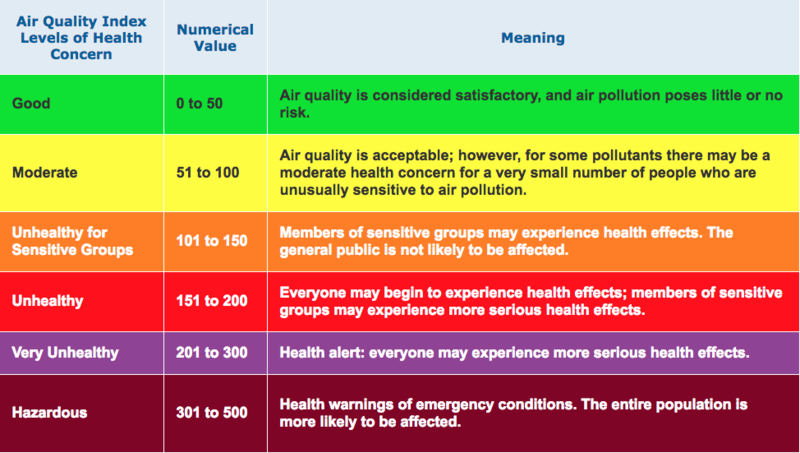 The AQI uses a simple scale of 0-500, 0 is great, 500 is terrible. Green is good, dark red is horrible. The AQI does a great job of highlighting the pollution risks to the general population, but how do these risks translate to cyclists? On one hand, cyclists (and other fit individuals) are better equipped to handle the increased cardiovascular strain imposed by poor air quality . On the other hand, because cycling is a “high-ventilation” sport, our exposure to pollution is increased since we’re breathing more frequently, typically through our mouth which bypasses our nasal filtration system . Poor air quality impacts asthmatics the most, but those of us without asthma are still susceptible to airway inflammation, decreased lung function, cognitive impairment, and a decrease in VO2max, red blood cell count and hematocrit [3-5]. Yes, there are real consequences to exercising in poor quality air, but how do you weigh these consequences against the need to ride your bike? Let’s be honest, if you’re in race shape and you stop riding, your performance is likely to take an immediate hit . Now it could be that you’re due for some extra rest, and maybe sitting around on the couch is the perfect antidote to riding too much, but if you’re stressing about losing fitness and have to keep the pedals turning here are a few guidelines. My favorite site for air quality information is airnow.gov. Pull up a map of your local region and get a perspective on the air quality around your home turf. 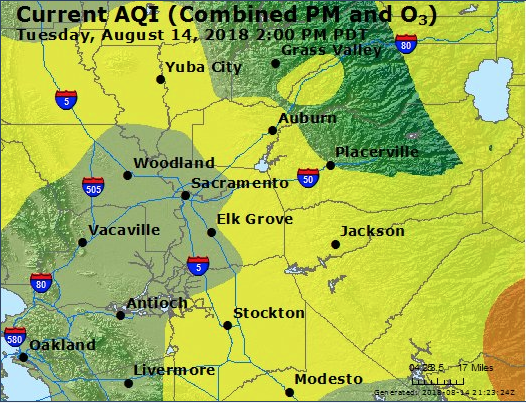 Make sure to pay attention to air quality along your route, not just the AQI of your current location. 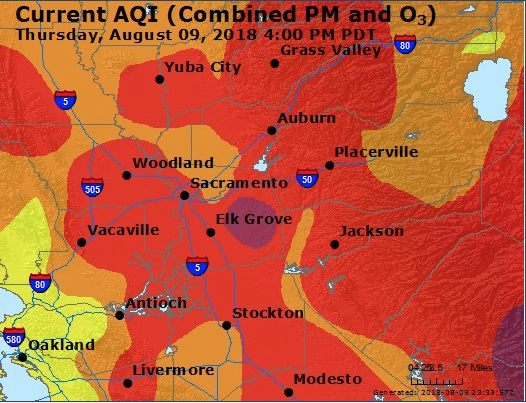 My personal rule of thumb is that I’ll ride if the map shows yellow (AQI 50-100), but anything into the orange I’m staying home. If you’re unsure about how poor air quality might impact you, check with your doctor. He/she is much more qualified to give you medical advice than this blog post or your buddy at Tuesday Night Worlds (unless he/she is a doctor in which case you should listen to them). Alright, one last call to stop beating yourself up and just rest. Unless you’re getting paid to race your bike, does it really matter if you take an unplanned week off the bike? No, it doesn’t. Read a book, clean your garage, or make dinner for the family. I’ve already written a short post about training in the mornings, but when it comes to air quality, early morning ride times help to minimize exposure to afternoon ozone . If you’re hoping to ride with clean air, your best bet is to roll early. As best as you can, try to ride in an area with as little car traffic as possible. The closer you ride to major highways or roadways, the greater your exposure to particulate matter [7, 8]. If you’re riding in Sacramento or another city with a great bike path system, these routes away from cars are often your best bet. Obviously the longer you’re breathing like a freight train when the AQI is increased, the greater your risk. A simple training modification is to crank up the intensity, and turn down the duration of your planned ride. Even a 10-minute ride can be effective at maintaining fitness  while serving to minimize your exposure to pollutants. If you’re allergic to the trainer, moving indoors is your last option to avoid bad air. No need to flog yourself for multiple hours indoors, keep things short, sweet, and intense and wait for the air to clear. Agency, E.P. Air Quality Index Basics. 2016 August, 2016 [cited 2018; Available from: https://www.airnow.gov/index.cfm?action=aqibasics.aqi. Giles, L.V. and M.S. Koehle, The health effects of exercising in air pollution. Sports Med, 2014. 44(2): p. 223-49. Cutrufello, P.T., J.M. Smoliga, and K.W. Rundell, Small Things Make a Big Difference. Sports Medicine, 2012. 42(12): p. 1041-1058. Kargarfard, M., et al., Effects of polluted air on cardiovascular and hematological parameters after progressive maximal aerobic exercise. Lung, 2015. 193(2): p. 275-81. Bos, I., et al., Physical activity, air pollution and the brain. Sports Med, 2014. 44(11): p. 1505-18. Mujika, I. and S. Padilla, Detraining: loss of training-induced physiological and performance adaptations. Part I: short term insufficient training stimulus. Sports Medicine, 2000. 30(2): p. 79-87. Rundell, K.W., et al., Vehicular air pollution, playgrounds, and youth athletic fields. Inhal Toxicol, 2006. 18(8): p. 541-7. Raub, J.A., et al., Carbon monoxide poisoning — a public health perspective. Toxicology, 2000. 145(1): p. 1-14. Gillen, J.B., et al., Three minutes of all-out intermittent exercise per week increases skeletal muscle oxidative capacity and improves cardiometabolic health. PLoS One, 2014. 9(11): p. e111489.